The portfolio was produced in the spirit of solidarity with the Zapatista movement and with the many autonomous communities in Mexico. The twenty artists who produced imagery inspired by these struggles for autonomy, and by the new political horizons opened by the resistant acts of speaking and listening that emerged after the uprising on January 1, 1994. The artists offer their work as a starting point to reflect on the power of those struggles, and to spark a shared conversation about what this autonomous theorizing and practice can offer us as we walk together toward a new world. Participating artists include: Argelia Leodegario, Bec Young, Elizabeth Mota, Fernando Martí, Gandhi Noyola, Iseo Noyola, Jaime Villarreal, Jesús Barraza, Joel Martínez, Kevin Caplicki, Lilian Guigue, Lucía Vidales, Mariana Sasso, Marshall Weber, Mazatl, Melanie Cervantes, Roger Peet, Salvador Alba, Thea Gahr, Yobany Mendoza. The Zapatistas’ Revolution: 20 Years of Building Autonomy: Interference Archive will host a salon to celebrate the moment 20 years ago when the Zapatistas rose up to challenge the Mexican state and global capitalism, reminding us that “another world was possible.” For most, the word Zapatista conjures images of masked rebels in the in the jungle. 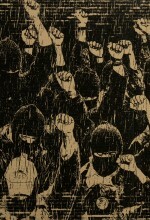 Although the real revolution of everyday Zapatista life is less glamorous, it is more far-reaching. Long-term activists will share their experiences working with the Zapatistas in solidarity and on community projects since 1994. They will lead a discussion on the years since the uprising–with a focus on the ways that the Zapatistas have put their ideas into practice by creating alternative governance in the form of autonomy. In what ways can we say the Zapatista uprising has been a success and what have they achieved — locally, nationally, and globally? Join us for this critical reflection of one of the most important revolutionary political formations of recent years.